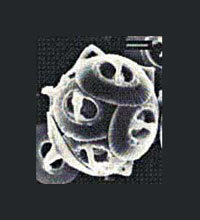 Coccolithophores are plant plankton (also called phytoplankton). They carry out photosynthesis – using sunlight to make food. Pictured here is a single Emiliana huxleyi, found in all oceans. Like other coccolithophores, it is a microscopic single cell encased in ornately shaped plates of calcium carbonate. Under favourable conditions, coccolithophores grow and divide rapidly, producing so many individuals that the surface of the ocean turns milky white.